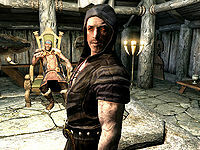 Este artigo é sobre the Dawnguard quest. Para the game you can play with children, veja Hide and Seek (game). Kill a vampire masquerading as a citizen. Dispose of the target (Traveling Bard, Traveling Pilgrim, or Visiting Advisor). Speak with Gunmar in Fort Dawnguard and tell him you are ready to offer some help. He has located the whereabouts of a vampire masquerading as a common citizen. He wants you to track him down and dispose of him. Your target would be a Traveling Bard, Traveling Pilgrim, or Visiting Advisor at a radiant city or town (this can include Raven Rock if Dragonborn is installed). However, the law is unaware of the danger and will treat you as a criminal if you're caught. He will advise you to act discretely and be vigilant about the law. Travel to your destination and identify your target. You may talk to him and expose him as a vampire. He will initially deny it. "I beg your pardon, sir/ma'am. I don't know what you're getting at, but whatever it is, it's not appreciated." Keep an eye on him and other potential witnesses. Take advantage of the darkness and kill him in sneak mode. Alternatively, you can ask him to come with you, if you can pass a speech check. Passed: Monster? What monster? Don't know what you're [sic] game is, but I'll humor for a moment. Lead the way. Take me to this "monster" of yours. But I'm warning you, do anything funny, and you'll regret it. Follow me, or you'll regret it. (Intimidate) Passed: Settle down. No need for threats. Lead the way. But I'm warning you, I'm not afraid to fight you if I have to. It would be safer to kill him in the wilderness. You can also lead him to some dangerous places, like a Dragon Lair, and let some hostile creatures do you a "favor". Return to Gunmar with the good news, he will be very satisfied. "Very good. That's one less monster we need to worry about. Though there's plenty more where he came from. Be ever watchful." Then enjoy your reward. The Traveling Pilgrim will be detected with Detect Life rather than Detect Dead, despite allegedly being a vampire, and produces Vampire Dust when killed. Attacking the vampire before he is hostile and killing him will increase your murder count statistic in your journal, regardless if you are detected or receive a bounty. One way to avoid this is to cast a Frenzy spell on him first. You can alternatively kill him as a werewolf or if Dragonborn is installed, use the Bend Will shout to command a dragon to kill him. (DB) If your quest arrow does not appear, your target may be on Solstheim. Traveling to Solstheim will make the arrow appear in the relevant location. Sometimes after killing the target without being seen, a single nearby Hold guard will become hostile. They won't attempt to stop you for a bounty (since there isn't one) and no other guards will be hostile to you. The quest was intended to go to a bard, merchant, or pilgrim, but instead of a merchant, a visiting advisor will be chosen. If so, there won't be any dialogue to convince him to come with you. 10 Gunmar has sent me to <Alias=Habitation>. I am to find and kill the vampire masquerading as a <Alias=Target>. I am to do so discreetly as the law is unaware of the threat and will assume I have murdered a citizen. 255 Finishes quest I found and killed the vampire masquerading as a <Alias=Target> in <Alias=Habitation>. On the PC, it is possible to use the console to advance through the quest by entering setstage DLC1RH01 stage, where stage is the number of the stage you wish to complete. It is not possible to un-complete (i.e. go back) quest stages, but it is possible to clear all stages of the quest using resetquest DLC1RH01. Esta página foi modificada pela última vez à(s) 01h37min de 13 de março de 2015.